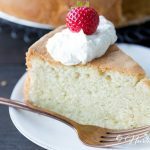 Classic Gluten Free Pound Cake–a dense, buttery delicious dessert that is perfect for any occasion. 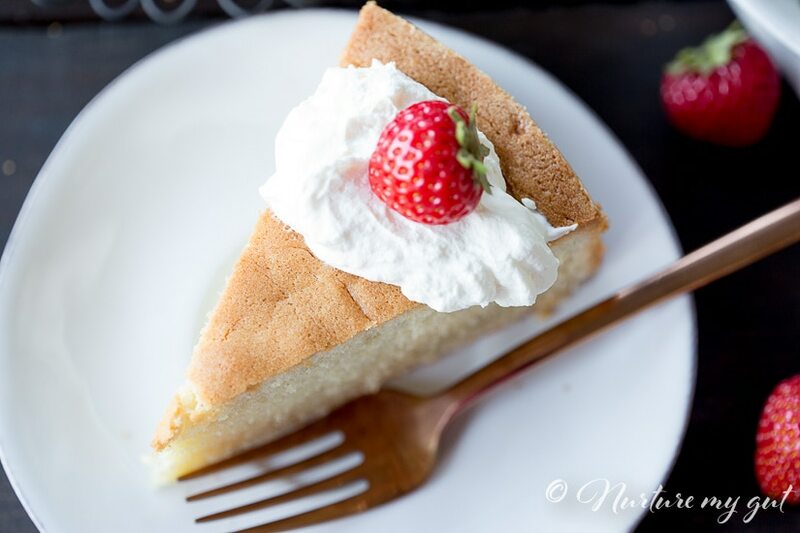 This famous cake is made with Bob’s Red Mill 1 to 1 Gluten Free Flour for an easy no-fuss dessert. 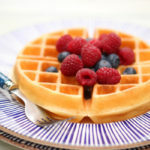 Top it off with whipped cream and fresh berries for a crowd pleasing favorite. 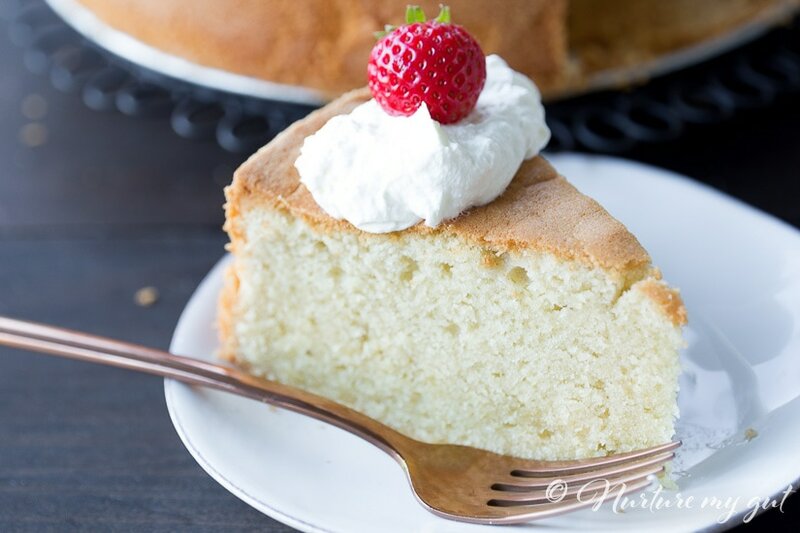 If you are having special guests over for brunch or dinner, pound cake is a great show stopper dessert. I made this in a 9” cake pan and it was so tall and beautiful that all it needed was a little dollop of homemade whipped cream and strawberry to top off each slice. I made this last Saturday for a dinner party and my friend said that this reminded her of the cake her Mom would make growing up. When a cake can bring you warm memories of home, that is a very good thing. 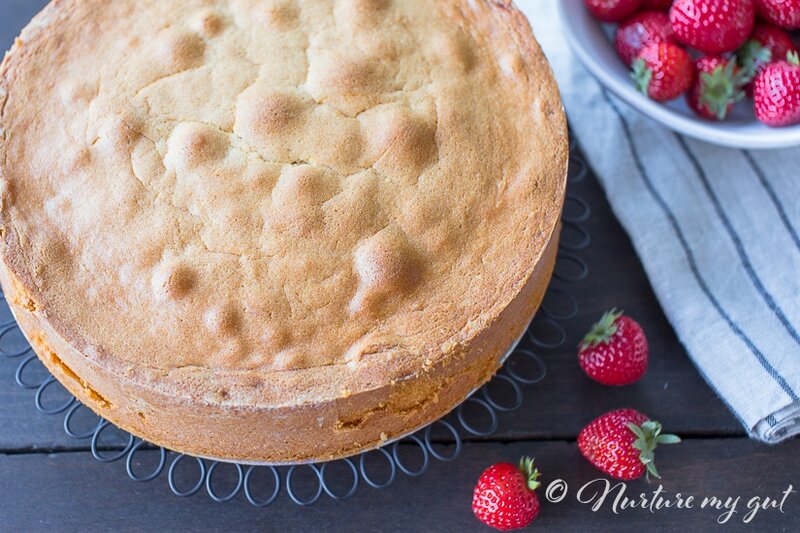 What is a Classic Gluten Free Pound Cake? A Classic Gluten Free Pound Cake is a cake that was invented around the 1700’s that contains each a pound of flour, eggs, sugar and butter. The ratios are pretty similar and it is very easy to make. 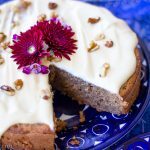 This cake is a blank canvas, mine just has vanilla but it can be turned into marvelous different variations, which I am sure I will be getting into and sharing on the blog. 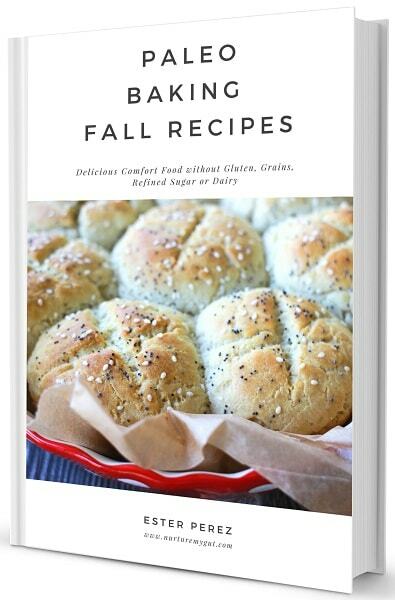 I modified the original recipe I found in the book called “Gluten Free Baking for the Holidays” and reduced the sugar from 1 3/4 cups to 1 cup, removed the lemon juice and replaced the homemade gluten free blend she uses in the book for Bob’s Red Mill Gluten free 1 to 1 Baking Flour . 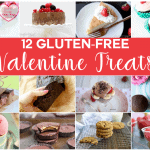 One day I will make my own gluten-free all purpose flour, but at the moment I don’t have too much need for it because I only bake desserts for special occasions- and let me tell you…I don’t like them overly sweet. 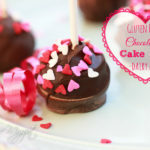 I have a few classic desserts on my blog like Gluten Free Pumpkin Pie and Chocolate Cupcakes. They have just the right amount of sweetness and I promise, they’re fabulous! 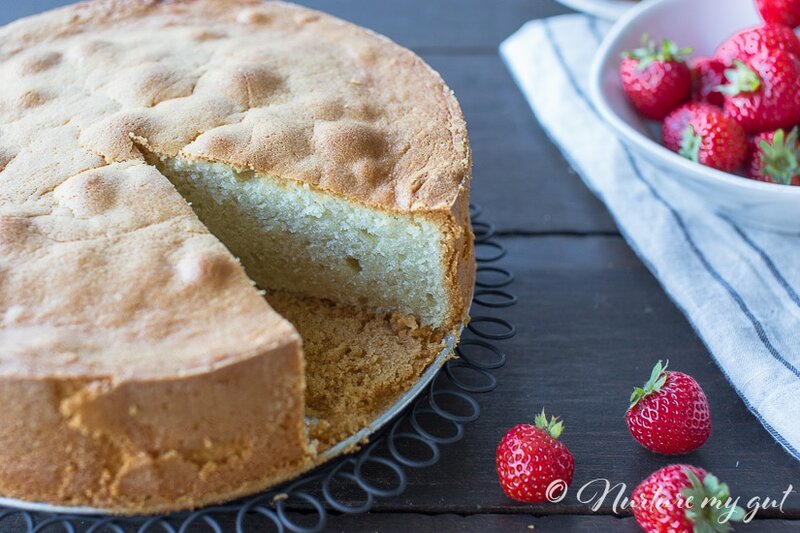 How easy is it to make Classic Gluten Free Pound Cake? The truth is that it very easy! 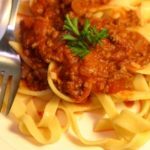 I modified the original recipe to make this in one bowl! I like my baking to be as simplified as possible. First, beat the butter and sugar until fluffy. Then slowly add in eggs, vanilla and salt. Next, goes in the gluten free baking flour and keep beating until it is fully incorporated. Yup! That is simple! I even used my Kitchen Aid stand mixer and it did all the mixing! It is my life saver in the kitchen! Then, I put it in a greased and floured 9” removable cake pan and baked it for exactly 60 minutes at 350 degrees Fahrenheit. It came out perfect! The result was a tall, dense beautiful golden yellow cake with a height of about 3” high! 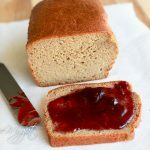 What is the texture of Classic Gluten Free Pound Cake? 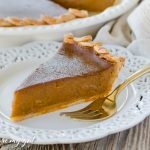 The texture is dense, buttery and moist. Traditionally, pound cakes are made without baking powder so be sure to expect a denser cake. The butter will give this cake a rich and decadent flavor. Measure properly. 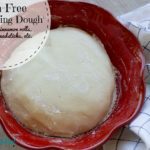 Use dry measuring cups and use a spoon to scoop gluten free flour into the cup until it overflows, then level off the flour with the back flat edge of a butterknife. Not measuring the flour can create a very dry cake. Keep oven door closed until it is time to check your pound cake. Peeking may cause your cake to drop. Wrap any leftover cake in plastic wrap and store at room temperature for up to 5 days. Be sure to wrap properly so that your cake does not dry out. 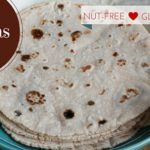 Bob’s Red Mill Gluten free 1 to 1 Baking Flour –this is my go-to gluten free flour, for baking when I am not making grain free desserts. It has a light texture, neutral flavor and is Non-GMO. 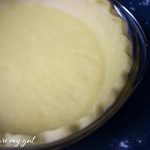 9” removable cake pan–this is my favorite cake pan because it is easy to remove your cake after baking. I just leave the bottom on and place it on my serving tray. I like to keep my baking as easy as possible. Kitchen Aid stand mixer or Electric Hand Mixer–this is essential in beating the butter and sugar together until fluffy. As a result, it will bring more air into your cake so it rises higher. 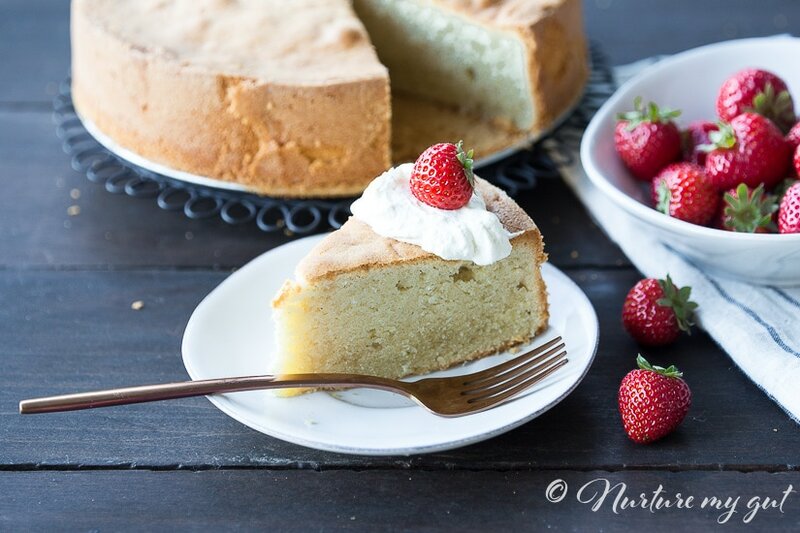 As If you are looking for a special homemade traditional dessert, then this Classic Gluten Free Pound Cake will certainly serve your family well. 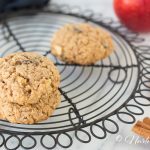 If you try this recipe, let me know what you think! 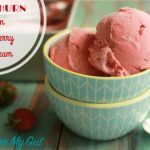 Leave a comment, pin it, and don’t forget to tag a picture @nurturemygut on Instagram. 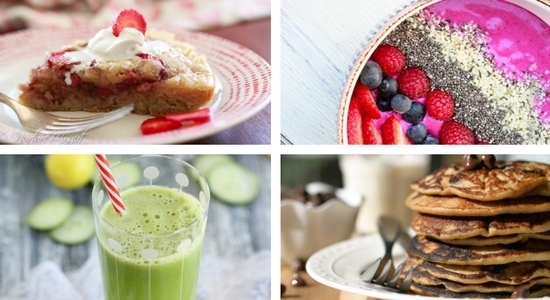 I love to see your kitchen skills in action! Grease a 9” removable bottom leak-proof cake pan with butter and dust with tapioca flour. In a KitchenAid mixer, beat together butter and cane sugar on high until light and fluffy, about 5 minutes. Lower speed and one at a time, add eggs. Beat on medium speed, 1 minute. Lower speed and add salt and vanilla extract, beat another 30 seconds. Keep speed on low and add gluten free flour, 1/4 cup at a time until fully incorporated. Scrape down sides if needed. Pour batter into pan and smooth top with a spatula so it is spread out evenly. Bake for 60 minutes or until a toothpick inserted into the center comes out clean. Place cake on a wire rack. Next, slide a knife along the outer edge to release cake. Remove outer ring and allow cake to cool on wire rack. Once pound cake is cool, serve with whipped cream and fresh berries. 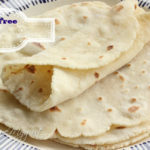 Wrap leftover cake in plastic wrap and store at room temperature for up to 5 days. I’m planning on making this , this week. By using the Springform pan, have you experienced any leaking of the batter with it? I mistakenly tried to make a different cake recipe in the springform and it leaked all over the oven! Perhaps I will line it with parchment paper.